A Dunder Mifflin flashback we all need and deserve. 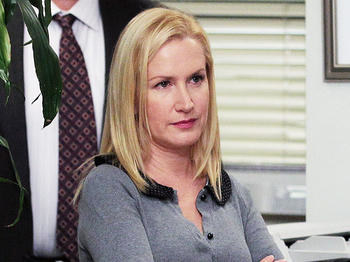 If you're a fan of The Office, you obviously remember Angela Kinsey as Angela Martin — Head of Accounting and party planner extraordinaire. In case you didn't know, Angela's Instagram is a gift to us all. ...or allegedly shutting down her nephew's attempt to use her fame to score dates on Tinder, we love her for all of it. And now, Angela has blessed us fans of the greatest workplace comedy of all time (don't @ me) with these rare videos from the set, which she recently discovered on her old computer. It turns out People.com gave Angela a camera to shoot some behind-the-scenes videos on the set of The Office, and she just recently discovered some of the old footage she took! Naturally, Jenna Fischer chimed in, feeling a bit "weepy" and nostalgic. And here's part two of the BTS action — including a weirdly hypnotic dance from Oscar Nuñez, aka Oscar Martinez. OMG, how much do we love the fact that Angela Kinsey kept a picture of her real-life grandmother on her character's desk? Ok. Y'all can keep your Lindsay Lohan dancing in Mykonos video. This will just be playing on a loop in my brain from now until forever. Thank you, Angela, for giving us this magical gift.